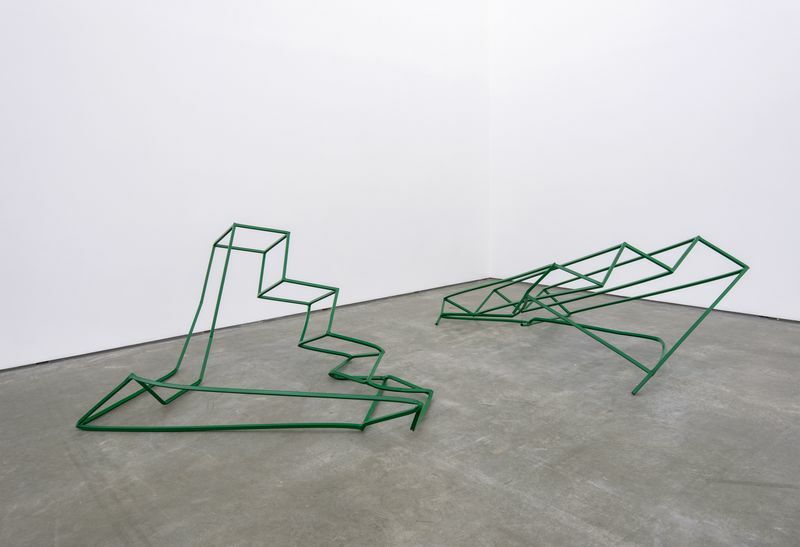 Monika Sosnowska’s sculptural language emerges from a process of experimentation with, and the appropriation of, construction materials such as steel beams, concrete, reinforcing rods and pipes. These elements – the solid and rigid foundations of buildings – are manipulated and warped, taking on an independence in which their former functionality is implied yet defunct. The formal language of her works echoes different contradictory Modernisms: that of the Polish constructivism of the 1930s; the minimal and conceptual tendencies of the international art of the 1960s and 1970s; and modernist architecture as experienced in Eastern Europe. 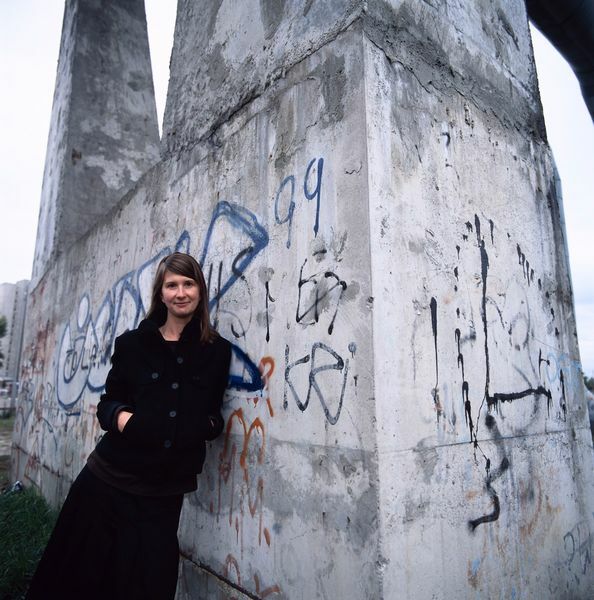 Sosnowska was born in 1972 in Ryki, Poland and witnessed the change of Poland’s political system from Communism to Democracy, and the the heavy impact this had upon society and her environment. In 2003, she achieved international renown with her work ‘The Corridor,’ an intervention that formed part of the Arsenale exhibition of the 50th Venice Biennale. 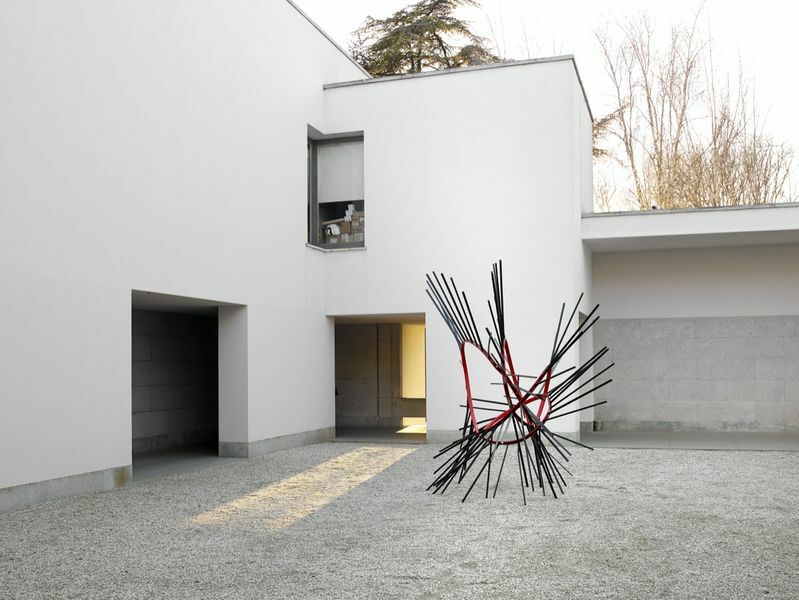 Four years later, Sosnowska represented Poland at the 52nd Venice Biennale with the monumental installation ‘1:1’. The almost organic construction of steel beams she created was intended to exhibit the Polish Pavilion itself. Using parts of the building’s infrastructure, Sosnowska occupied the entire space with a second architectural structure on the inside. ‘1:1’ not only reflects the architecture of many of the Venetian pavilions, but at the same time, brings to the fore the global discourse on functionality, in a marked departure from modernism’s preoccupation with style. In her recent works, Sosnowska has incorporated elements of modernist architecture and recognizable details including staircases, handrails, gates and window structures to create unexpected, even uncanny, encounters. She treats buildings as a site of memory, and is adept at conveying both political and psychological significance through her work. She quotes architectural irregularities, collaging different elements together to form a whole that appears at once both confused, yet intentionally and attractively designed. Space is encountered as a psychosomatic quality, as political as its experience is personal, forever veering in the mind of the viewer between the uncanny and the Sublime. 2015 Weber, C. Sylvia, 'Skulptur', Künzelsau: Swiridoff, 2015, pp. 44 – 46, 114 – 117, ill.
2014 Griffin, Jonathan, Harper, Paul + [et al. ], 'The 21st Century Art Book', London: Phaidon, 2014, p.251, ill.
Moszynska, Anna, 'Sculpture Now', London: Thames & Hudson, 2013, p. 140, ill.
2012 Dillon, Brian, 'Parasites', in: Parkett 91, Zurich, 2012, p. 22 – 33, ill.
Bonami, Francesco, 'The Cabinet Dr. Sosnowsi, in: Parkett 91, Zurich, 2012, p.34 – 46, ill.
Mytkowska, Joanna. 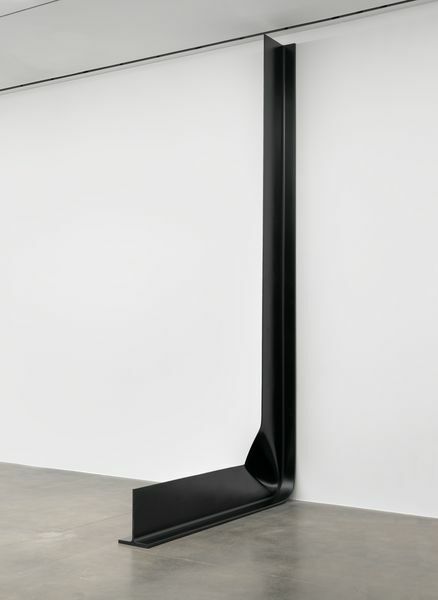 'The Liquid Modernity of Monika Sosnowska's Sculptures, in: Parkett 91, Zurich, 2012, p. 47 – 57, ill.
Gassner, Hubertus, Görgen, Annabelle, Schulz, Christoph Benjamin (eds. ), 'Alice im Wunderland der Kunst', Ostfildern: Hatje Cantz Verlag, 2012, p. 151, ill.
Hacklin, Saara, 'Divergencies of Perception, The Possibilities of Merleau-Pontian Phenomenology in Analysis of Contemporary Art', Helsinki: University of Helsinki, pp. 215 – 230, 238 – 286, ill.
2011 Von Alphen, Ernst + [et al. ], 'Polish! 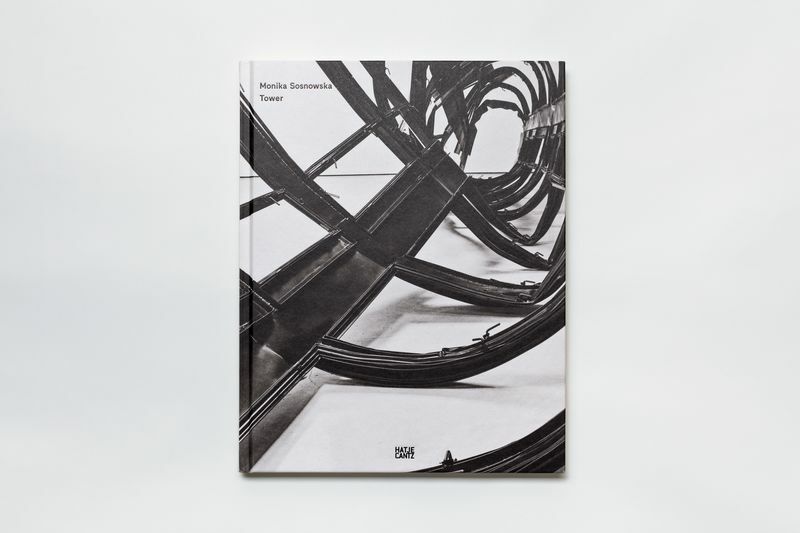 Contemporary Art From Poland', Ostfildern: Hatje Cantz Verlag, 2011, pp. 250 – 257, ill.
2010 Adler, Phoebe, McCorquodale, Duncan, 'Contemporary Art in Eastern Europe', London: Black Dog Publishing, 2010, pp. 58 – 59, ill.
Morineau, Camille, 'ARTISTES FEMMES. De 1905 à nos jours', Paris: Centre Pompidou, 2010, p.153, ill.
2018 Volpicelli, Anna, 'The Art Lover's To-Do This January', on: http://www.7x7.com, San Francisco CA, 8 January 2018, ill.
2017 ___, 'Monika Sosnowska', on: wsimag.com, New York/NY, 20 December 2017, ill.
Ong, Amandas, 'The hidden bones of buildings', on: apollo-magazine.com, London/UK, 14 December 2017, ill.
___, 'Monika Sosnowska's Architectural Sculptures Ruminate on the Politics of Building Material', on: www.artnet.com, 8 December 2017, ill.
Carey-Kent, Apul, 'Monika Sosnowska', in: World of Interiors, London/UK, January 2018, ill.
___, 'Indywidualna Wystawa Moniki Sosnowskiej w Londynskiel Galerii', on: rynekisztuka.pl, Worclaw/PL, 13 December 2017, ill.
Nawrat, Allie, 'Monika Sosnowska exhibits at Hauser and Wirth, London', on: theglassmagazine.com, London/UK, 20 November 2017, ill.
Kimmel, Erin, 'Monika Sosnowska', in: 'Artforum', New York NY, October 2017, p. 256, ill.
___, 'Monika Sosnowska's 'Wall' at Kurimanzutt, Mexico City', on: http://www.blouinartinfo.com/news/story/2364459/monika-sosnowskas-wall-at-kurimanzutto-mexico-city, 18 July, 2017, ill.
___, 'Can you spot Utopia in among this wreckage? ', on: uk.phaidon.com, London, 29 June 2017, ill.
___, 'Monika Sosnowska', in: 'Artforum', New York, May 2017, p. 279, ill.
Dawkins, Chad, 'Monika Sosnowska at The Contemporary Austin', on: www.glasstire.com, Houston, 31 January 2017, ill.
Muller, Nat, ' A Poetic Sharjah Biennial for a World in Turmoil', on: www.hyperallergic.com, New York, 12 May 2017, ill.
2016 ___, 'Indianapolis Museum of Art showcases commanding steel sculptures by artist Monika Sosnowska', on: www.artdaily.com, Indianapolis, 24. October, 2016, ill.
van Ryzin, Jeanne Claire, 'The Contemporary’s Jones Center grows on Congress Ave.', on: www.austin360.com, Austin, 13 July 2016, ill.
2015 Verner, Amy, 'Celebrating Calder. 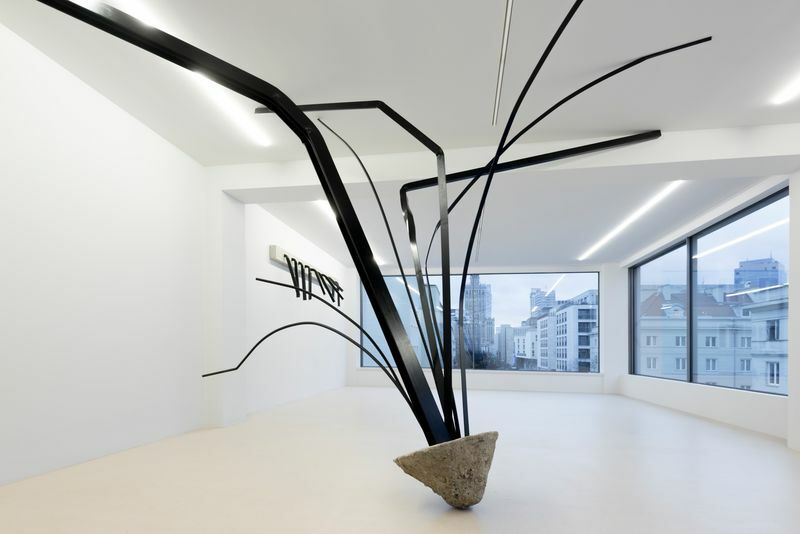 Cahiers d'Art celebrates latest release with Monika Sosnowska solo exhibition', on: www.wallpaper.com, London, 12 June 2015, ill.
2014 A. Macadam, Barbara, 'Monika Sosnowska. 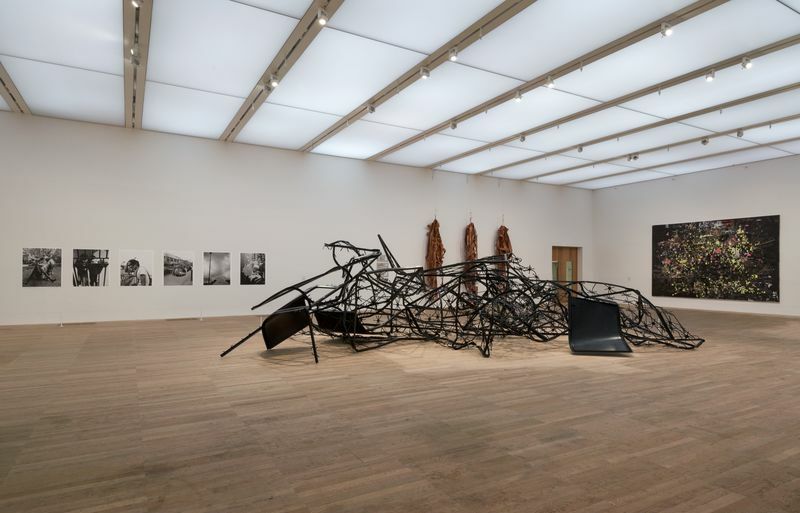 Hauser & Wirth, September 5 – October 25', in: ARTNews, New York, November 2014, pp. 110, ill.
Kastner, Jeffrey, 'Monika Sosnowska. Hauser & Wirth', in: Artforum, New York, November 2014, p. 274, ill.
Steadman, Ryan, 'Real Steel: Two Sculptors Dot Chelsea with Great, Mammoth Work', in: New York Observer, New York, 20 October 2014, p. 44, ill.
Rogers, Nick, 'Contemporary Archeology', on: artefuse.com, New York, 5 October 2014, ill.
___, 'Around Town. What is going on in North America', in: Modern Painters, New York, October 2014, p. 14, ill.
Creahan, D., 'New York – Monika Sosnowska: ''Tower'' at Hauser and Wirth Through October 25th, 2014, on: artobserved.com, New York, 23 September 2014, ill.
___, 'Monika Sosnowska at the Atelier Calder: An interview with Dorota Czerner and Alexander S. C. Rower, President of the Calder Foundation', on: contemporarylynx.co.uk, London, 22 September 2014, ill.
Holmes, Jessica, 'Looming Tower: Monika Sosnowska at Hauser & Wirth', on: www.artcritical.com, New York, 20 September 2014, ill.
Hruska, Jordan, 'Monika Sosnowska: Tower', on: www.domusweb.it, Milan, 12 September 2014, ill.
Indrisek, Scott, '5 Must-See Gallery Shows: Johannes VanDerBeek, Monika Sosnowska, and More', on: www.blouinartinfo.com, New York, 11 September 2014, ill.
Graver, David, 'Monika Sosnowska's 110-Foot-Long TOWER', on: www.coolhunting.com, New York, 5 September 2014, ill.
___, 'Monika Sosnowska at Hauser & Wirth', on: newyorkarttours.com, New York, September 2014, ill.
Lui, Louise, 'Monika Sosnowska's Tower on view at Hauser & Wirth', on: www.theglassmagazine.com, London, 18 August 2014, ill.
___, 'Monika Sosnowska at Perez Art Museum Project Gallery', on: www.miamiartguide.com, Miami, 15 July 2014, ill.
___, 'Monika Sosnowska, 'Stairway' Capitain Petzel', on: www.artnet.com, New York, 21 March 2014, ill.
2013 Nelson, Robert, 'Monuments to the failure of modernist architecture', on: www.brisbanetimes.com.au, Brisbane, 4 September 2013, ill.
Denton, Max, 'Monika Sosnowska: Regional Modernities', on: www.melbourne.concreteplayground.com.au, Melbourne, August 2013, ill.
Mellema, Tatiana, 'Monika Sosnowska: Twisting History', on: www.canadianart.ca, Toronto, 22 August 2013, ill.
Rule, Dan, 'Memories recast in metal', on: www.watoday.com.au, Subiaco W.A., 10 August 2013, ill.
Conner, Shawn, 'Twisted metal, bleak northern landscapes this summer at CAG', on: www.vancouversun.com, Vancouver, 9 August 2013, ill.
___, 'Monika Sosnowska: Regional Modernities', on: www.timeout.com, Melbourne, 21 June 2013, ill.
___, 'History Reshaped', in: Aesthetica, York, no. 53, June 2013, p. 23, ill.
Howard, Christopher, ' Monika Sosnowska', in: Art Papers, New York, March 2013, p. 61, ill.
___,'Don't take the stairs. Distorting the Aspen Art Museum', in: Modern Painters, New York, February 2013, ill.
Travers, Andrew, 'New exhibitions open at Aspen Art Museum', on: www.aspendailynews.com, Aspen, 19 February 2013, ill.
2012 Hayes, Kelsey, 'Reading the Streets: Monika Sosnowska's 'Fir Tree'', in: Auction Central News, Online, 21 December 2012, ill.
__, 'Monika Sosnowska and Jim Lambie at The Modern Institute Glasgow', on: www.moussemagazine.it, 13 December 2012, ill.
Bell, Kirsty, 'Life through the Eye of Architecture. Das Leben durch das Auge der Architektur', in: Camera Austria, no 120 2012, Graz, pp 9 – 20, ill.
2011 Vogel, Carol, 'Six Named as Finalist for Hugo Boss Prize', in: The New York Times International Herald Tribune, New York, 25 November 2011, ill.